I feel obligated to put a few posts on the back burner in lieu of our impromptu “TheExpeditioner.com Ski Week 2009” (tag- you’re it, Matt). Next topic: Heli-skiing. To those not familiar, this Jaunted headline will fill you in pretty quick: “Take A Helicopter To Ski Where (Mostly) No One Has Skied Before.” I’d like to highlight two specific areas that stand out as the center of the heli-skiing universe; Revelstoke, British Columbia and Valdez, Alaska. At Canadian Mountain Holidays, you can use their isolated backcountry lodges to access “endless powder runs, epic tree skiing and unrivaled fun,” in and around Revelstoke. 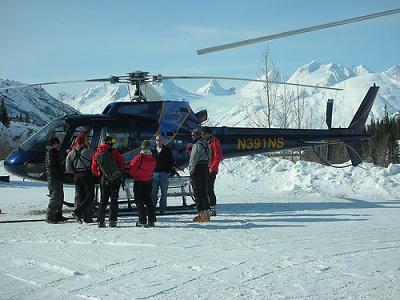 Similarly, Valdez Heli-Ski Guides claims their terrain “is unlike anything you could ever imagine.” I, personally, agree with both statements. Heli-skiing is NOT, nor ever will be, for beginning skiers and riders. Seriously. Heli-skiing is NOT, nor ever will be, cheap (a four day trip will run you between $7,000- $10,000). Heli-skiing is NOT, nor ever will be, anything less than epic.